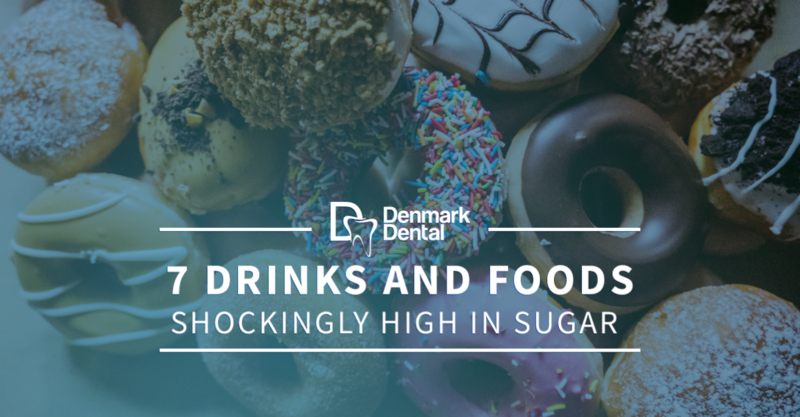 As your dentist in Eagan, we want to warn you of the dangers behind eating too much sugar, as it relates to your oral health. Not only is high sugar consumption bad your overall health, but it’s also detrimental to your oral health. For most, sugar consumption won’t take a negative effect on their teeth for a few years. These people say that they will eventually reduce their intake and check in with their dentist. Unfortunately, even losing a tooth doesn’t deter their sugar-heavy diet. If you love your barbecue food, you need to double check the amount of sugar in the sauce you’re so keen on smothering your meat with. Surprisingly, many BBQ sauces offer consumers a high dose of sugar per serving — and most don’t follow the single serving size guidelines found on the nutritional label. So, if you want to eat less sugar and improve your oral health, find a sauce that’s better for your oral health. If you remember, a few years ago there was a yogurt trend that took the diet and fitness world by storm. Yogurts of all kinds were positioned as being a great “health” snack for on the go individuals. Well, yogurt is another food that can also be high in sugar. You will want to check the nutritional information to determine just how much sugar is in the product. Your gums and teeth will thank you. Did you know that Ketchup is one of the most popular condiments globally? It’s hard to think of a meal that can’t be improved with ketchup. For most, they reach for ketchup before they reach for salt or pepper. When it comes to Ketchup, however, you want to be aware of your portion sizes. Ketchup, typically, does include sugar, but it’s not so high that you should be concerned about using it. Just keep in mind how much you use per meal. Similar to actual fruit, fruit juice does contain some form of vitamins and minerals. But guess what else it also contains? A whole lot of sugar. What’s more, as you’ve seen mentioned before, most people drink double or triple the suggested serving size, which doubles or triples their sugar intake for that beverage. If you’re health conscious, double check the sugar content of your fruit drinks to make sure you’re not overdoing it. You see them on television all the time. Professional athletes are shown in profile drinking sports drinks after a hard workout. But what those commercials don’t explain is that sports drinks are designed for people who participate in long, intense workouts. The high sugar content of sports drinks is specifically designed for quick absorption into the body. Now, sports drinks are still high in sugar content, and there are better ways to get good sugar for your body during and after a workout. Consider switching out your daily sports drink for something healthier. A delicious, low-fat health food that’s great for on the go snacking and early morning breakfasts. What you need to keep an eye out for with granola, whether in bar or grain form, is the sugar content. If you take a look at most granola bars currently sold in the grocery store, they have a relatively high sugar content. Make sure you check the sugar levels to determine how much sugar you’re actually eating. When you pour the first cup of coffee for the day, what do you add next? Most add a spoonful (or five spoonfuls) of sugar. Others pour flavored creamer into their coffee. How about your afternoon tea? Do you add extra sugar to the beverage? Take note of where you add sugar to beverages and foods. Is it time for your biannual oral checkup? Contact Denmark Dental today to schedule your appointment.